Being a musician is not an easy task, especially since you will require professional instruments and accessories that certainly don’t come cheap. And, while you can skip some of the accessories, other ones like music stands are pretty much mandatory if you want to become a virtuoso. So, after going through plenty of online product reviews, we have come to the conclusion that one of the best music stands available on the market right now is the new Manhasset Model 48 because it is one of the most durable music stands made, it features a lightweight yet steady design, and it is secure to use at any height for maximum visibility, even when dealing with heavy loads of music sheets and practice books. In the unlikely event that the Manhasset Model 48 would not be available for purchase, we suggest taking a look at the Musician’s Gear Deluxe Conductor as a viable alternative. Made of heavy-gauge steel, this item is sturdy and reliable. The compact shape won't occupy too much space, so it can be easily stored anywhere you want. It is fully adjustable according to your height requirements and will remain locked at your preferred height thanks to the no-friction tilt neck. 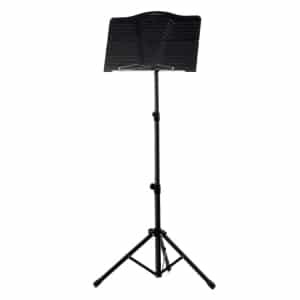 The music stand is specifically designed to hold heavy loads of music sheets and books. The base doesn’t fold up so it may be difficult and inconvenient to transport from one place to another. 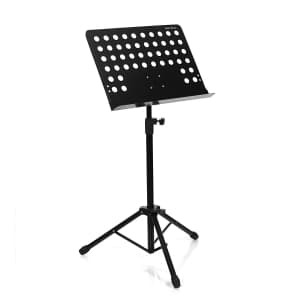 Sturdy and reliable, you can count on this music stand to store all your music sheets and ensure you easily read them, without forcing your eyes. This product is designed to meet the standards and needs of professional musicians, so expect high quality and plenty of features. The bookplate is sturdy and made of steel, allowing you to place as many music sheets and books as you want without bending or breaking it. The stand is also removable, ensuring easy and convenient storage and transportation. The height of the tilt is adjustable between 24-45 inches. Although not a product flaw, some customers weren’t pleased with the quality of the customer service. This music stand is designed to last you a long time from now on and help you practice or play no matter how tall you are. You can count on it for sure. What we liked the most about this particular item is that it’s available in various sizes and heights to fit the needs of all musicians. It comes with a strong tubular steel frame that won’t rust or break in time. It is very stable on the ground so it won’t move unless you want it to. The foldable plastic desk ensures the product is easy to store and carry with you. It is delivered with a height-adjusting clamp to ensure the perfect match for you. The plastic frame seems rather flimsy and isn’t thick enough, meaning it won’t support heavy music books or too many sheets. The product’s greatest quality is its flexibility, which makes it easy to carry with you anywhere you go. Consider this option if you travel a lot. We know that finding the right music stand could be difficult, especially with so many great options available on the market. If you don’t want to waste any time searching for the best products yourself, we have come up with a list of top items you should take into account. This product is made of heavy-gauge steel for maximum stability and will require the minimum amount of space to display on stage or storage. 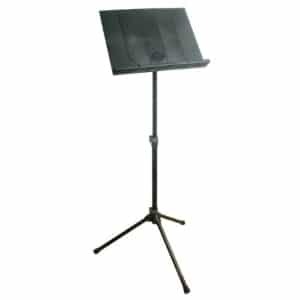 Convenient and easy to use, this product is recommended by many customers around the world, being called as one of the most durable music stands ever made. What we also liked about this product is the solid brass bearings, and the heavy-duty chrome inner shaft, durable enough to hold large weights and provide maximum sustainability. Just like the name suggests, this is a deluxe product specifically aimed to meet the needs and requirements of professional musicians. What we liked the most is the return lip with a tilting feature of the steel bookplate. This item is removable from the vertical shaft to provide increased versatility for you. Thus, you can rotate your music sheets and adjust the tilt according to your own needs for maximum visibility while playing. This will provide uninterrupted hours of practice that will turn you into the best musician of your kind. The product is adjustable at any height between 24 and 45 inches, meaning it is perfect for almost all musicians, regardless of their height. This will provide a steady and locked height for you to see your music sheets without a glare and with ease. The bookplate is also large and wide enough to cover all your music sheets and practice books, with even some extra room left to store your pens. 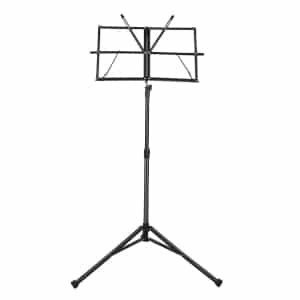 This item is available in plenty of sizes and heights to accommodate the needs of all musicians. The particular SMS-20 features a strong tubular steel frame for excellent stability on the ground. Even if it is made of steel, the product comes with a foldable plastic desk that provides a convenient and lightweight design. 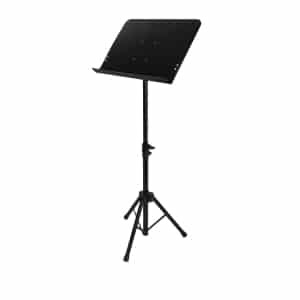 This means the music stand is easy and convenient to carry around and store anywhere you want. Carrying the stand with you won’t cause any back or hand pains. This music stand also comes with a quick clamp to easily adjust the right height for you. The height will remain secure and locked even when you add heavy loads of music sheets and practice books, for maximum visibility from all angles. If you purchase this product, you will also receive a carrying bag that allows you to easily carry, store, and protect your music stand from harsh weather conditions and dust. This stand measures around 50 inches from base to top and features a detachable desk that measures 32 inches wide. The product is designed for comfort, and the desk is large enough to hold up to 4 pages of music, which makes it ideal for groups and small bands. Thus, if you play in a group, you don’t have to worry about each individual carrying their own stand for music sheets that might occupy a lot of space on the stage. Thanks to tall stand with a wide enough desk, you and your band colleagues can place your music sheets on the same stand. Thanks to the auto adjust system you will be able to adjust the height of this stand to your ideal dimensions for maximum comfort and visibility while playing. Besides, by applying the right amount of pressure, the stand will lay flat without requiring additional wrenches to loosen it or tighten it back up. If you’re looking for a beginner’s item that won’t take too much money out of your pocket, this could be an interesting choice. The item is not just affordable, but also extremely well-built, so you can fully rely on it whenever you need it. The item is made of top-quality metal and features metal rivets to provide reversed flexibility of the plate, as well as maximum stability for the disk. This way you can adjust and arrange the plate just the way you want to have increased visibility and read your note easily out of your music sheets. The product also comes with an ABS screw button, and a locking knob of high-quality to ensure the locking of the device at the desired height. In other words, musicians of all heights will benefit from this music stand and customize it according to their own needs and specifications. Also, the rubber feet will prevent slipping and will reduce friction and loud noises when you practice or wish to carry around the stand with you. This product is part of Amazon’s line of own items and features an adjustable height and tilt for closely holding your music sheets. Both the knobs and the tilt are easy to use to provide maximum visibility and a comfortable viewing and reading angle, regardless of the light and its reflection. The item features a heavy-gauge steel base with rubber feet that not only provide maximum stability but are also non-slip and don’t make too much noise. As a result, it will be easier for you to carry around your stand and post it anywhere you want in the concert hall or rehearsal room. This stand comes with a metal sheet holder and a telescopic pole for extra comfort and easiness when you want to adjust the item according to your own needs and preferences. Moreover, you’ll be able to adjust the item’s height by simply applying up and down pressure, without requiring additional knobs. This product is made of heavy-duty metal and steel providing a guaranteed durable and prolonged lifespan. The professional stand features an adjustable height from 25 to 43 inches to benefit from great visibility while playing sitting or standing. The maximum overall height is 5 feet and 5 inches, tall enough for almost all music players, regardless of the instrument they are playing. What we like about the product is that, even though it is made of reinforced materials, it is also extremely lightweight and easy to carry around anywhere you want. The product folds flat for convenient storage and carrying. Purchase this item, and you’ll also receive a matching carrying bag to make transportation easier and shadow your stand from harsh weather conditions and dust. The bookplate also features generous dimensions and comes with a 2-inch lip and rolled edges for maximum strength and safety while displaying your music sheets. All additional accessories, including the knobs, the screw head, and the leg end cups are made of superior quality nylon. Gearlux is a company that provides a wide array of music accessories, so you should definitely check it out. All Gearlux products are made with a maximum responsibility to ensure a long-lasting design that won’t break or fold easily. The item is made of strong, sturdy, and reliable materials, providing a steady design and increased stability while standing. 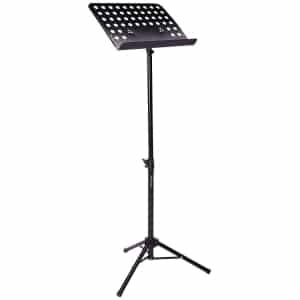 However, these stands are relatively lightweight by comparison to other similar music stands. This allows easy transportation no matter of your weight or height as a musician. 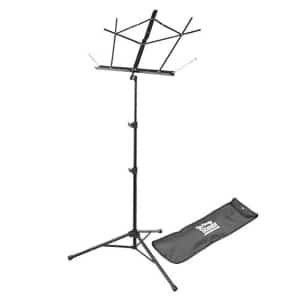 Similar to other music stands, this one also comes with an adjustable height from 28 to 48 inches, to meet the standards and needs of almost all musicians, whether they enjoy playing standing or seated. We like that the tray tilts are adjustable to 180 degrees for increased flexibility. Also, they are tall, wide, and deep enough to hold most of your misc sheets. In addition, the magnetic closure will easily secure your music sheets and prevent them from scattering all around the floor when you’re clumsy. For lead singers and those who want to make themselves heard, this Hola! Music microphone music stand is definitely an item worth mentioning. The product comes with a mounting system that allows you to use your tablet in order to make playing and sharing your music simpler and more fun. The holder is large enough to fit tablets and smartphones from 6 to 15 inches screen. Also, the tilt swivels 360 degrees for a portrait or landscape view on your tablet, whichever is the most relevant for you. The tilt is also adjustable for enabling a perfect viewing angle, no matter your height or size. What we also liked about this Hola! Music product is that it can be clipped to any available microphone stand, music stand or pole, so it gives you plenty of possibilities to use it, no matter if you’re a singer or a music player. The item comes with a complete set of instructions, and there are also many videos and materials available online to help you perfectly deal with this music accessory to best benefit you and your needs while on stage or rehearsing. 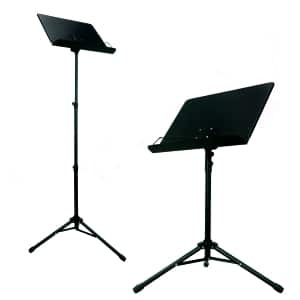 The product is available in two color choices and will meet the requirements of all musicians who need a good and affordable music stand. This is a three-piece design that features a completely foldable music stand for convenient carrying and storing whenever you are not using it. The music stand is made of super quality materials to ensure durability and steadiness no matter the surface you choose to put it on. The large and deep desk is also extremely reliable as you can use it to store all your music sheets and other small rehearsal music accessories. The height of this music stand is also easily adjustable to allow you maximum visibility and a clear angle without having to stay in uncomfortable positions just to be able to see your music sheet. Fully extended, the lip of the product is about 52 inches high and, according to some taller customers, a 6-foot tall musician will have a clear vision of the music he or she is playing. This great music stand doesn’t only come with an affordable price tag, but will also help you perform your music rehearsals easily. The product comes with a convenient shoulder carrying strap, as well as a Velcro opening flap for increased comfort while carrying. The item is also lightweight enough not to cause back or shoulder pains when traveling with it, so you can count on it anytime and anywhere you need to rehearse. 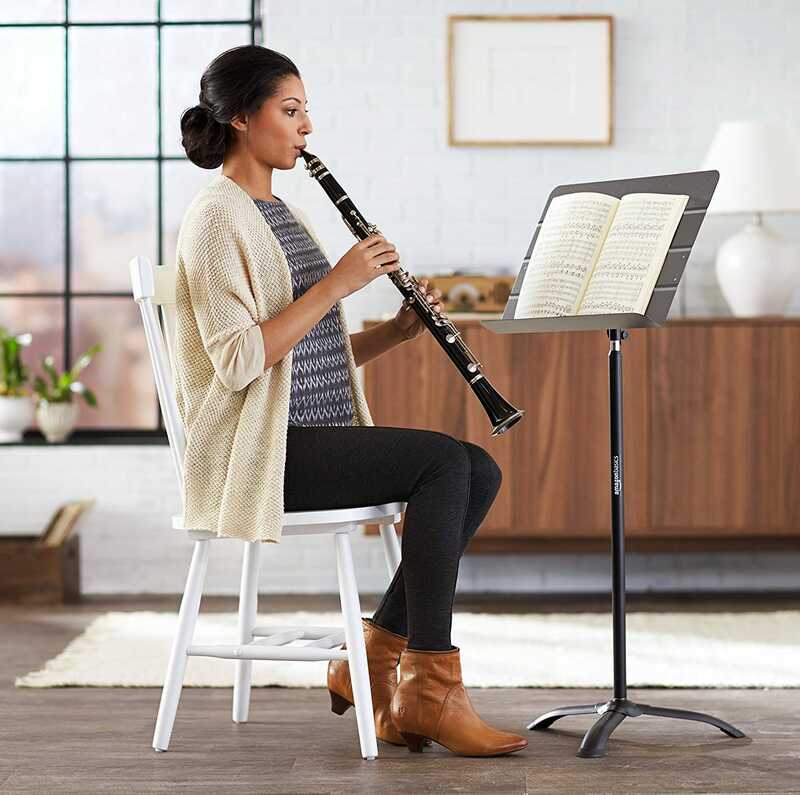 The product features an adjustable height from 20 to 52 inches which provides a design tall enough to fit the needs of almost all musicians, whether they enjoy playing while standing or seated. Thus, a 6-foot music player will have no problem easily seeing what’s written on the music sheets without having to bend or stay in an uncomfortable position. The rigid shape and the sturdy design make this music stand extremely stable and reliable, so you can count on it many years from now on. Also, the featured music stand is completely foldable to help you to easily carry and store the device whenever you are not using it. This product is made of heavy-duty steel to ensure a strong and reliable design you can count on for many years from now on. 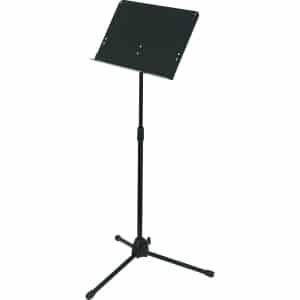 The main feature of this music stand is its foldable design up to a very small size, which makes it extremely easy and convenient to carry around or to store whenever you are not using it. Although made of superior quality steel, this product is at the same time lightweight, which counts when you have to carry it around with you the entire day. Another great feature is its adjustable height to meet the standards and requirements of almost all musicians. The height is adjustable from 37 to 58 inches, which makes it extremely easy to use by musicians who enjoy playing while standing. Seated musicians might find the music stand a little too tall for maximum visibility while looking at their music sheets. Nevertheless, this is a popular product which has received many positive reviews from happy customers all over the world. This product is extremely popular amongst young musicians and teenagers who are passionate about music. It is extremely lightweight and very portable, which means you can easily carry it with you the entire day and place it wherever you want. Thus, even the little musicians can carry it around them without suffering from back or shoulder problems. The item features a fully folding sheets, and that makes the design suitable for school classes, choirs, church bands or full-sized orchestras. Also, the music stand is perfect for those playing the violin, guitar, flute or other instruments. The bookplate is large enough to provide room for your music sheets and other small accessories you might require during practicing. In addition, the tilting bookplate can be adjusted to different angles to meet your requirements while playing standing or seated. As a result, you will benefit from maximum visibility from all angles, and you won’t be bothered by light either. This item comes in a classic charcoal design and features a large and wide bookplate with rolled edges for increased strength. As a result, you can easily display your music sheets and even some heavier music books to allow you to practice your instrument. The product also features angle-adjustment tension knobs to remove it from the upper shaft easily or to adjust the size and the angle of the bookplate according to your needs. Thus, you will benefit from maximum visibility, and you will reduce eye fatigue during prolonged rehearsals. The music stand comes with a fully adjustable height anywhere from 24 to 45 inches in order to meet the standards of almost all musicians, regardless of their height or how they enjoy playing – standing or seated. Unlike many other similar products on the market, this design comes with available replacement parts, meaning you won’t have to buy an entirely new music stand whenever one of the pieces breaks. The item is available in four different designs to meet the needs of different musicians, so make sure to choose the right fit for you. The particular FL-06RB features a lightweight and extremely portable design that allows you to easily carry the product with you. You can conveniently store it whenever you’re not using it thanks to the folding sheet stand included. The latter is suitable for all guitar, violin or flute players, as well as for other instrumental performers. The bookplate is large and wide enough to carefully store your essential music sheets, and will also provide extra room for additional playing accessories or essential items you would like to keep with you at all times. 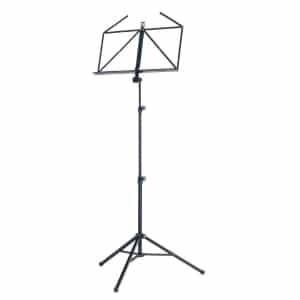 The height of the product is adjustable anywhere from 80 to 143 cm to comfortably support the needs of almost all musicians, regardless of their height. Moreover, musicians can play both while standing or when seated and will benefit from maximum visibility both ways. This item comes with a completely foldable bookplate to ensure an easy carrying everywhere you go. It is made of superior quality materials that are resistant and reliable in the long term. Also, thanks to the foldable design, it will be extremely easy to use the provided carrying bag to take this product with you on your rehearsals or to conveniently store it even in the narrowest places whenever you’re not using it anymore. 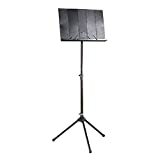 You can adjust the height of this music stand anywhere from 19 to 46.5 inches, meaning this product is perfect for almost all musicians, regardless of their height or music choices. The product is suitable for full-size orchestras, school, choirs, classrooms, church bands, and others more. The superior quality rubber feet will prevent the stand from increased friction and will provide extra stability when standing. In addition, it will diminish the noise made by moving the stand from one place to another. This is a professional and fully collapsible music stand which will certainly be useful to a wide array of musicians, regardless of the instrument they’re playing on. The item is made of durable and reliable materials and features a lightweight design that allows you to easily carry it with you anytime you need it. It is perfect for holding your music books, music sheets, laptops, smartphones or tablets, so it allows you great versatility when rehearsing or playing your own music. The featured bookplate is large enough to store all your music sheets or additional playing accessories and is fully adjustable, allowing you to benefit from maximum visibility from all angles. Also, it comes with a 2-inch platform that will hold even the heaviest songbooks or large music sheets. The metal spring arm extensions are able to secure down your music sheets and hold them in one place while you’re rehearsing. Also, the height of the music stand is adjustable from 32 to 58 inches to perfectly meet the requirements of all musicians, no matter how tall they are. What we liked the most about this product is that it comes in many color choices available to meet the chromatic preferences of all musicians. It is also a great and versatile item perfect for young musicians and teenagers who love music and prefer to express themselves as freely as possible through every mean they can. The item features an adjustable bookplate that large and wide enough to fit up to three music sheets simultaneously. Thus, the product is also perfect for small music bands or duets. The foldable bookplate enables easy carrying and convenient storing whenever you’re not using the music stand. Also, the tripod leg assembly is completely adjustable to meet the needs of different types of floor spaces and provide maximum stability and sturdiness while you are rehearsing. Last but not least, the height of this item is adjustable from 26 to 40 inches, which is enough to provide a clear vision and the perfect angle for almost all musicians. Thanks to this complete set you and your music will step into the 21st century for sure. This professional and fully collapsible music stand is made of top-quality heavy-duty metal to provide maximum steadiness and reliability. The metal spring arm extensions will also lock down your music sheets and additional songbooks to keep them safe in the same place. The music stand features an adjustable height from 28.5 to 47 inches, long enough to meet the requirements of almost all musicians. As a result, you will benefit from the perfect angle and visibility whether you choose to play standing or seated. 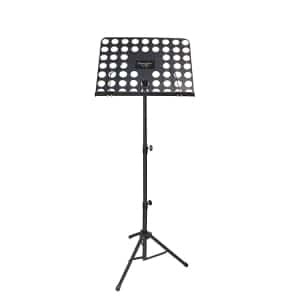 The sturdy metal tripod support legs this item is equipped with will ensure maximum stability so you won’t have to worry about the maximum load of music sheets or playbooks you intend to put on it. Lastly, this music stand comes with a complete set of accessories to help you rehearse and perform as good as possible. You’ll get one LED clip-on light, one music sheet clip holder, and one carrying bag. This standard music stand is perfect for beginners or little musicians who want a lightweight and a reliable item at the same time. The collapsible design features a removable desk for extra portability. It also makes the item to be easily carried around and stored in the most convenient spaces whenever you are not using it. The height of the music stand is also adjustable to a large degree, meaning you will be able to set it according to your own height and preferences. This way you will ensure the perfect angle and maximum visibility for your music sheets. In addition, the perfect height will also help you perform easier, without having to worry about uncomfortable body postures or eye fatigue after prolonged hours of rehearsal. 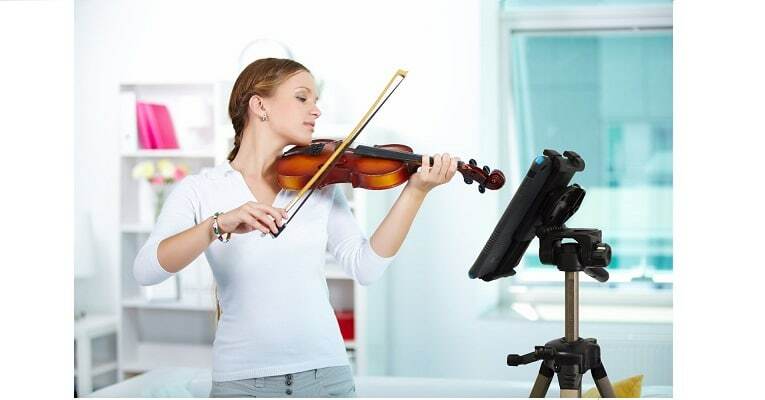 The music stand also features a folding tripod base for increased stability so you can count on the device anytime, anywhere, regardless of how many playbooks or music sheets you choose to carry with you. This item is designed to meet the standards and requirements of all music players. It is made of strong and durable steel for increased stability so you can rely on it anytime you need it. The black design is the perfect choice for professional music players. This item features an adjustable height anywhere from 21 to 48.5 inches, which is more than enough to meet the standards and requirements of all musicians, regardless of their height. In addition, the item can be easily used by players who like to play both standing or seated. The bookplate is large and wide enough to accommodate all types of music sheets and playbooks so you can rest assured you will always be able to rehearsal accordingly. Moreover, the bookplate also comes with an adjustable angle to allow perfect visibility and reduce eye fatigue. This way you will get to perfectly see the notes on your music sheets from anywhere you stand. 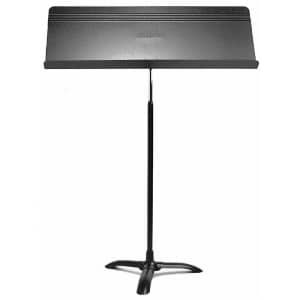 Choosing the best music stand is not always an easy task, especially with so many products available for sale. 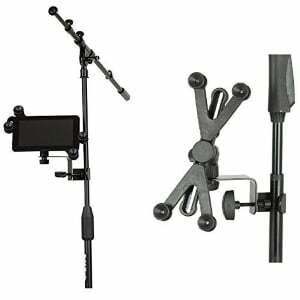 So, the following buying guide aims to look at the most important features such a device should have and to allow you to opt for a good music stand, regardless of your budget. First of all, you should know that the materials used to manufacture the music stand are one of the most important features in such products. The most common materials used are (stainless) steel, wood, and plastic, each coming with their own set of pros and cons. For instance, a wooden music stand is quite lightweight and is perfect for when you are already used to its dimensions. It offers great stability and can support most of your music sheets and playbooks. However, it is not adjustable in any way, so you cannot control the angle of the bookplate or the height of the item to best suit your playing needs. 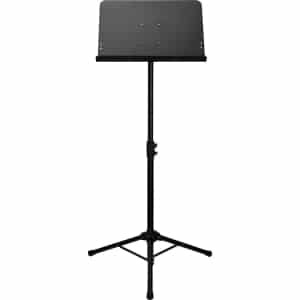 If you’re looking for a cheap music stand, a plastic music stand would be the rational option. 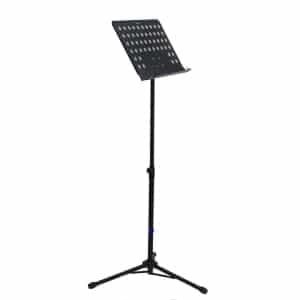 This extremely light music stand is mainly suitable for beginners or small musicians who cannot carry around large weighs. Nevertheless, they are not extremely reliable and cannot support the weight of a full music book. In our opinion, a heavy-duty music stand made of steel is not only reliable but also extremely convenient. Most of these items are easy to carry around and feature an adjustable height or a foldable design which makes them easy to carry around and store according to your needs. Before deciding which one is the best type for you, we suggest going through some music stand reviews and read what other customers have to say about a certain product. Also, the reviews of music stands allow you to read the experiences and opinions of other customers who already purchased the product, which makes it easier for you to decide on the right item for your own needs. Another important feature to look for in a music stand for sale is its adjustable height. Most of the items available now for sale come with this feature, but it is also important to see exactly how much your item can stretch. 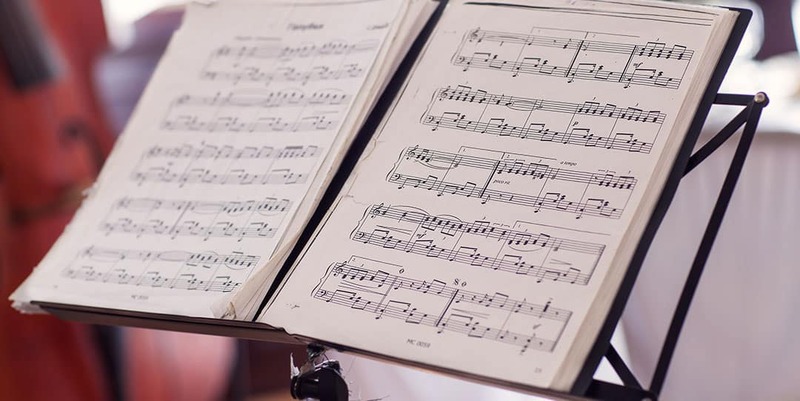 Keep in mind that different musicians have different needs and come in plenty of heights, so your music stand should be able to provide you a clean and clear vision on the music sheets. Taller music players may have to look for stretchy items that can reach 50 inches in height or slightly less to ensure maximum visibility from where they’re standing. It is also important to look for the lower adjustable heights if you are a petite person and like to perform while standing. No matter if you choose a used music stand or a brand new one, this feature is also of great importance. A foldable design means the bookplate can be folded or even taken off for maximum portability and a lightweight design. This is extremely important if you travel a lot or use to carry around your music stand with you anywhere you go. Also, a collapsible design will lower the size of your music stand up to the perfect one so you can easily carry and deposit the item whenever you are not using it. 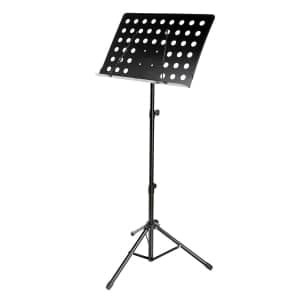 This type of foldable music stand is perfect for youngsters or smaller musicians who are not allowed to carry around big weights. Some items come with included accessories that are extremely useful, so make sure to give these music stands a try. For instance, a music stand with light will provide the perfect luminosity for you to see the music sheets and playbooks even in darker rooms. Also, the light will not catch and reflect the light of other devices, meaning you will get to clearly see what’s written on your music sheets. A music stand for iPad or a music stand for keyboard come with extremely similar designs and feature specifically-made bookplates to store all your smart devices. Whether we talk about iPods, iPads, laptops, keyboards, smartphones or tablets, these bookplates will provide an adjustable design to allow you to play your music easier and faster. 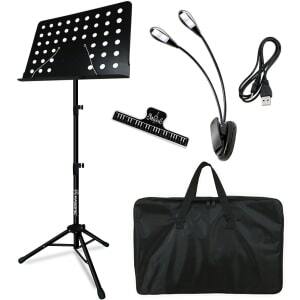 Last but not least, you should also consider buying a music stand with a bag if you wish to store your item safely. 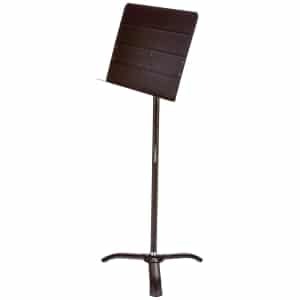 A music stand with a case will prevent the item from corrosion, harsh weather or dust and will help you enjoy it for a prolonged period of time. What can a music stand be made of? We have previously answered this question in the buying guide above, so we will only go through the main materials. 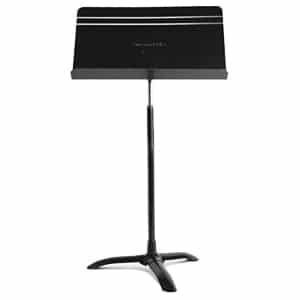 Most of the music stands are made of reliable steel to ensure long-lasting performances and allow you to place heavy playbooks and plenty of music sheets. The more affordable versions are made of hard plastic or wood, but these are often not adjustable, so they’re not entirely useful if you like playing both standing or seated or you wish to adjust their height to be more comfortable with you. How can I make my own music stand? 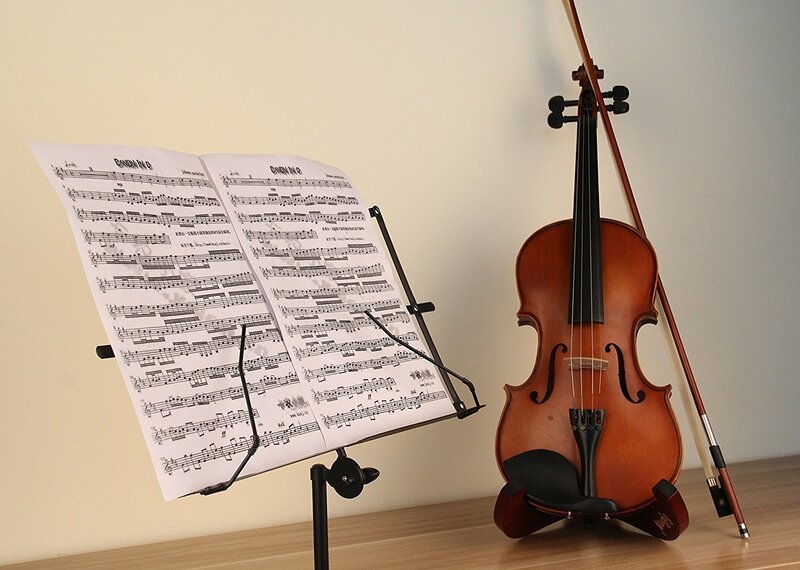 If you’re a good wood crafter, you can easily make your own music stand from standard pieces of wood, as long as they are reliable and fit your height and music requirements. However, to achieve a professional design with all its features, you should appeal to steel or other hard case materials. Thus, we don’t advise you to try to build your own music stand. These products are not sold for a fortune, so the cost of you purchasing all items required for making the item plus the work you’ll have will sometimes end up being higher than the one you would pay for a brand new item from a specialized store. How to fold music stand? Most of the music stands with a foldable bookplate also come with adjustable knobs that allow you to put pressure on the bookplate or slide it into sides to fold it as much as you can. The mechanism is simple, and this is why the great majority of these stands don’t come with user instructions as they feature universally-known mechanisms. The key is to look beneath or aside from the bookplate to see any available knobs or sliding mechanism that you can use to fold the item perfectly. How to fix a music stand? Similar to the foldable system, fixing the height of a music stand is also available with the use of knobs. However, those items that don’t come with these features will simply require applying a certain pressure on the stand to downsize it according to your needs. You will have to do a similar operation but in reverse, meaning you will have to pull the stand to achieve an increased height should you opt for this. Either way, check the instructions available before deciding to adjust the size of your music stand. How much does a music stand cost? This really depends on its type, mainly the materials it is made of, as well as of its design and other available accessories. However, most music stands won’t cost you a fortune. Their prices can range between 15 and 40-50 dollars, depending on their settings, and number of accessories they feature. 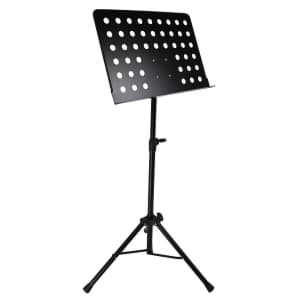 You could also pay more for a music stand if it also comes with a cover or a storage bag as these items are designed to keep your stand safe and free of dust, rust or harsh weather conditions.